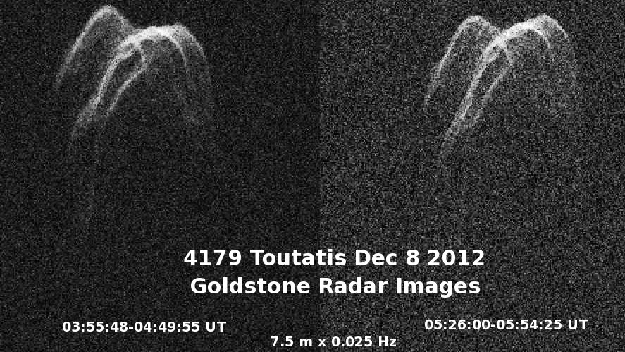 Sequences of Goldstone delay-Doppler radar images of Toutatis from the 2012 observing campaign. In each image, range increases down and Doppler frequency increases toward the right, so rotation is counterclockwise. Each image from Dec. 4-7 has the same range-Doppler extents, but later images do not (at least not yet...stay tuned...we plan do to this). Dec. 4: Weighted sum of 32 runs. Toutatis is an irregular and very elongated object. The group of bright pixels at the bottom right is an echo from a topographic feature that's barely visible along the radar terminator; it's not a satellite. Dec. 6: Weighted sum of 35 runs. This is a "broadside" view more or less along one of the asteroid's shorter axes. 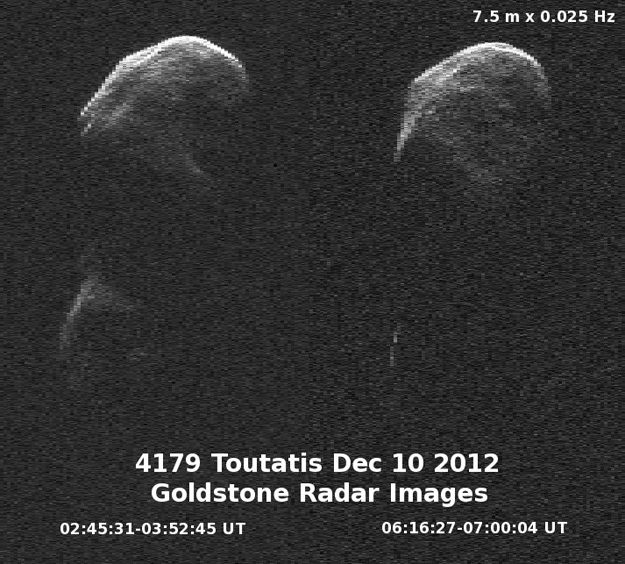 Dec. 7: Toutatis appears nearly end-on in this view, which shows a weighted sum of 49 runs. Due to the irregular shape and it slow non-principal axis spin state, the appearance of Toutatis in radar images can change dramatically from day to day. 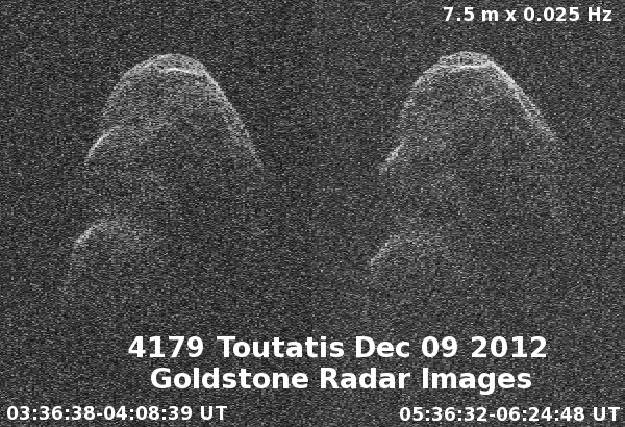 Dec. 8: Two images of Toutatis obtained over an inteval of about two hours. Although Toutatis is a very slow rotator, a small amount of rotation is evident between the two frames. Considerable detail is visible in the images. Note that the resolution is 7.5 m/row, 2.5x finer than on the previous three days. The improved resolution is a consequence of the asteroid's smaller distance and thus higher signal-to-noise ratio. Dec. 9: Two images showing a modest amount of rotation over an interval of almost three hours. Because of the elongated shape of Toutatis and the radar shadows it casts, the lower part of the echo appears almost disconnected from the top even though they are in contact. Each day Toutatis looks different because the shape is irregular and because it is in a non-principal axis spin state, which means that the instantaneous spin vector is changing. Dec. 10: Two-panel collage that shows obvious rotation by Toutatis. The entire interval spans about 4 hours and 15 minutes, with a lengthy gap in between the imaging while we were observing with other configurations. There's a pronounced facet on the left side. The echo looks split into two sections due to the irregular and elongated shape of the asteroid and due to radar shadows cast by the large lobe at the top. As the asteroid rotated, the more distant lobe nearly vanished behind the shadow cast by the front.